I can't believe this is the last Football Friday post of the season. It feels like we just kicked off the season. I'm going to miss watching all the games and eating all the yummy tailgating food!!! 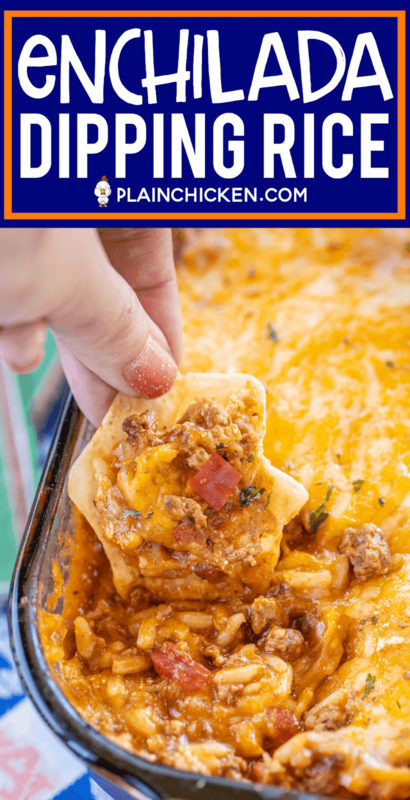 The last recipe of the season is a favorite! 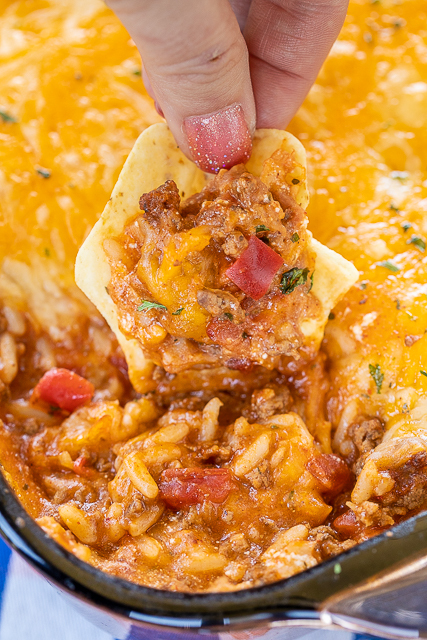 I really think I saved the best for last with this Enchilada Dipping Rice. Rice, taco meat, enchilada sauce, diced tomatoes and green chiles, refried beans and cheese! 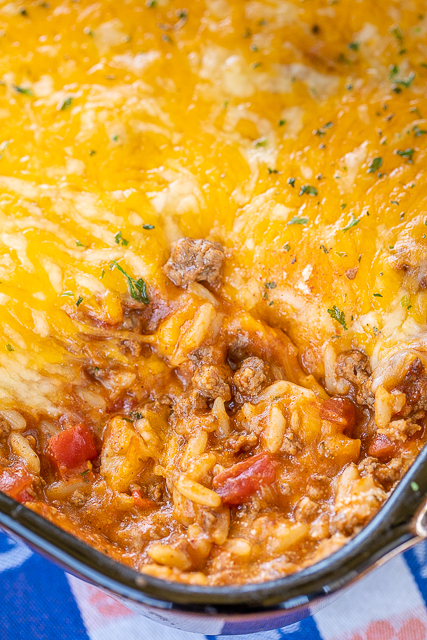 You can assemble this Enchilada Dipping Rice ahead of time and bake when ready. 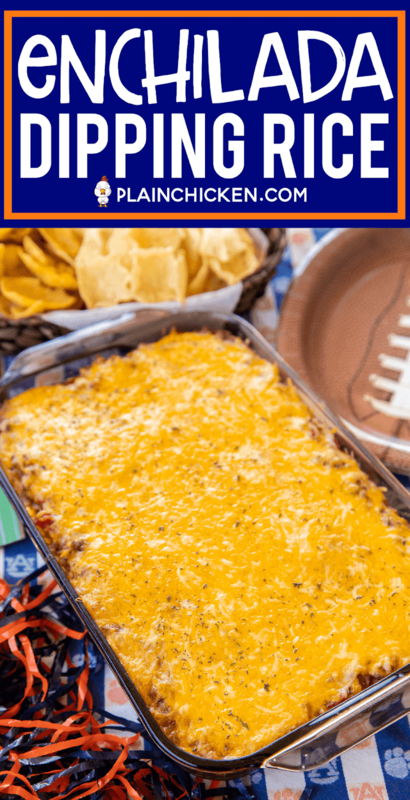 I used ground beef in this dip, but feel free to swap it for ground turkey if you are looking to cut down on the calories. You can use either brown or white rice - just use your favorite. 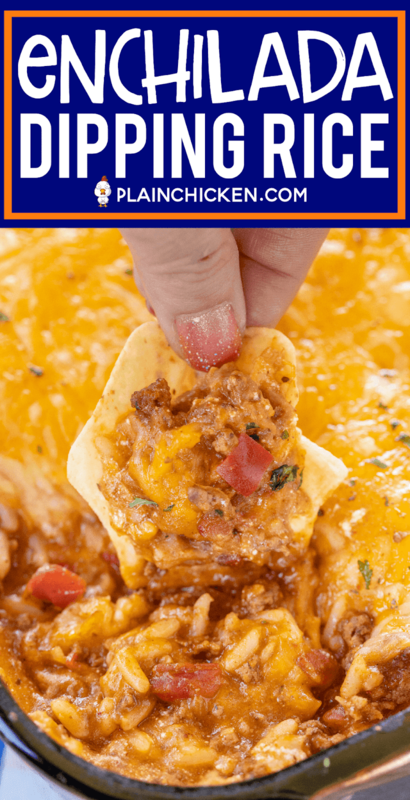 Fat-free refried beans also work great in this dish. 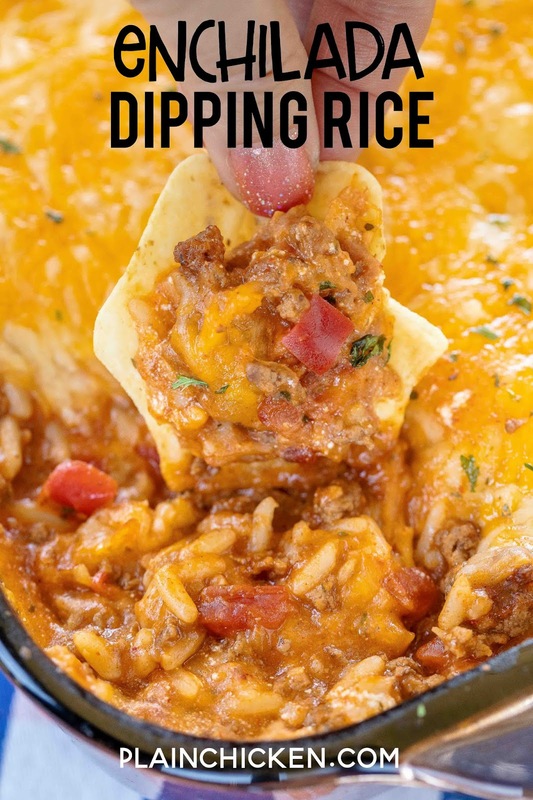 We served this Enchilada Dipping Rice as a dip with some tortilla chips. SO good! We ate this for lunch and absolutely LOVED it!! It would also be great spread on some tortillas. 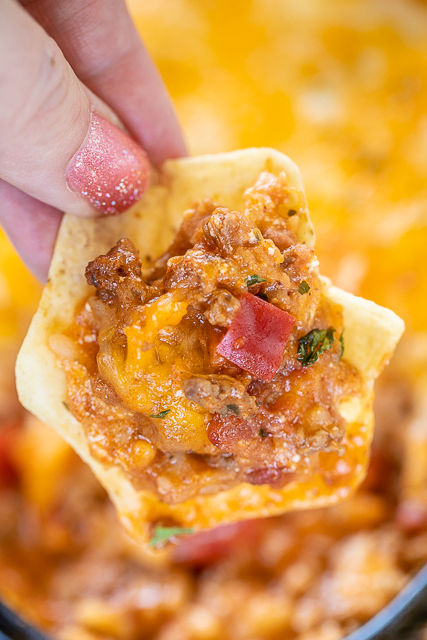 You could even just serve this as a main dish and garnish it with your favorite taco toppings. Sour cream, guacamole, olives, lettuce, tomatoes. SO versatile. 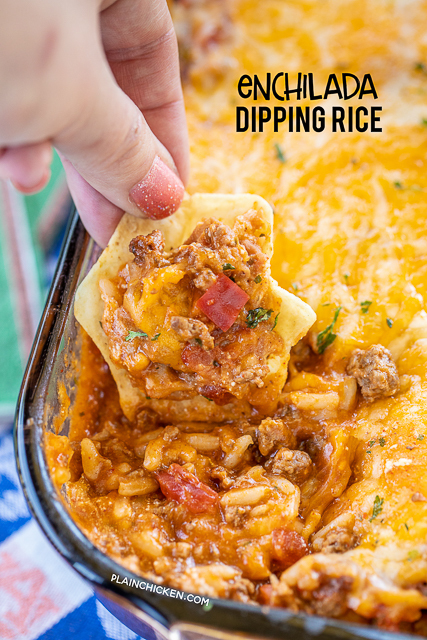 We LOVED this Enchilada Dipping Rice. I have it on the menu for Sunday along with some Crack Dip and some Sweet & Spicy Boneless Wings. I can not wait!!! YUM! 1 (10-oz) can diced tomatoes and green chiles, undrained. In a large skillet over medium-high heat, cook ground beef until no longer pink. Drain fat. Add taco seasoing and diced tomatoes and green chiles to meat in skillet. Stir and cook on low for 5 mintues. Remove from heat. Spread rice mixture into prepared pan. 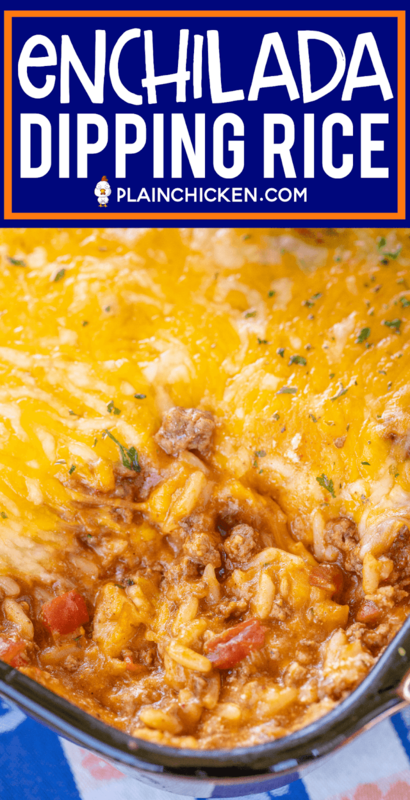 Top with shredded cheese. Bake until heated through, 20 to 30 minutes. 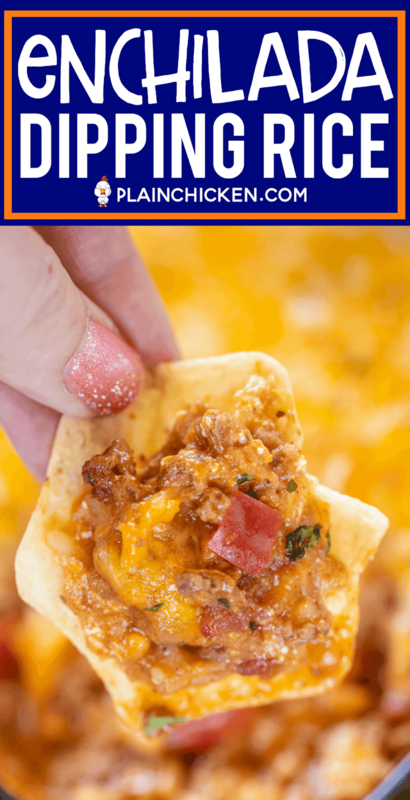 Serve with chips for dipping or garnish with favorite taco toppings and serve as a main dish. This recipe looks great. Would shredded chicken work in this recipe? I don't see why not. Enjoy! Yum!!! and then sour cream on top!! hell yeah! Go Rams! Just curious looks like there are either diced tomatoes or red bell pepper in the dish and I don't see that in the list of ingredients. 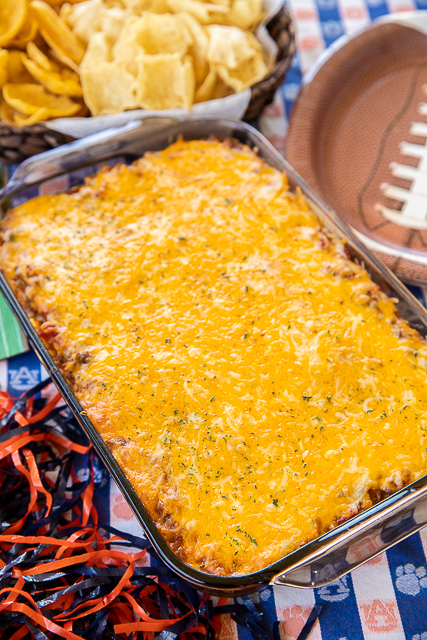 Just by looking at the pictures I know this would be a Dip my family would love! Yes - I left out the diced tomatoes & green chiles. I corrected the recipe. Thanks!! Thank you Stephanie, I'm looking forward to making this Sunday for our Superbowl lineup...GO RAMS!!! Should work just as good without meat, no? Sure. Maybe add some extra beans & rice since you would t have the meat in there. Stephanie, how much would you need to add for the extra beans? I am a vegetarian and would love to try this without the meat. Arizona - I don’t know exact amounts. I’ve only made this as written. Maybe an extra can of beans and an extra cup of rice? You will have to play around with it. Do you think this would freeze well? And if so, before or after baking? Sounds delish! omg, I am drooling! My son wants to cook a turkey, so boring!!! My grandson and I are def eating this tonight, yum. Thank you.